Home / Conventions / 2016 Nashville / COMING SOON! Nashville: Barbershop StyleBecome A Member! NASHVILLE Barbershop Style debuted at International Convention on July 5th, 2016 and online during convention week! This is NASHVILLE: Barbershop Style … a collection of eight country songs arranged in the barbershop style that will get your toes tappin’, feet stompin’, and voices ringin’! From beloved ballads to fast-paced, up-tempo tunes, this folio is the perfect resource for adding a little country flair to your quartet or chorus show or performing the entire collection as a complete set of country favorites. Part-specific learning tracks have been created along with a separate full-mix listening recording to help learn the songs quickly and accurately. This collection features classic country hits arranged by Gene Cokeroft, Aaron Dale, Tom Gentry, Rob Hopkins, Kevin Keller, Joe Liles, and Patrick McAlexander. “Forever and Ever, Amen” and “Ring of Fire” (Keller) and “Hey, Good Lookin’” (Gentry) are popular favorites from the BHS catalog, and “I Am a Man of Constant Sorrow” (Dale) from the Oscar-winning film O Brother, Where Art Thou? is newly published from the BHS library. “Rocky Top” (Liles) and “The Dance” (McAlexander) are both brand new arrangements created especially for this collection, and “Tennessee Waltz” (Cokeroft), as sung by legendary The Suntones, appears here for the very first time in print. This folio was created, in part, to help celebrate the 78th annual BHS International Convention, held on July 5-9, 2016, in the heart of Music City, USA. 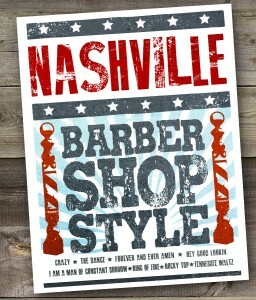 We hope “y’all” enjoy the barbershop twist on these great songs from the home of country music: Nashville, TN! *Available exclusively in this collection!